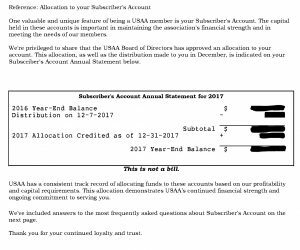 As a USAA member I have received Subscriber Savings Account (SSA) statements and distributions in the past, but I’ve always wondered what the purpose of the SSA was and how the Subscriber’s Account distributions were determined. What is The USAA Subscriber’s Savings Acccount? Based on the amount of income USAA earns during the year, the board of directors may allocate funds to a member’s Subscriber Account. The amount depends on the members existing account balance and the amount of auto and property insurance premiums that the member paid during the year. The account is not like a bank account as you cannot make deposits or withdrawals, or borrow against its balance. The account remains in effect for as long as you have at least one USAA auto or property policy. What is a USAA Subscriber’s Account Distribution? The USAA board of directors may authorize a Subscriber’s Account distribution annually. The distribution is a portion of the Subscriber’s Account balance paid out to the member. Below is my Subscriber’s Savings Account statement that I received for 2017. 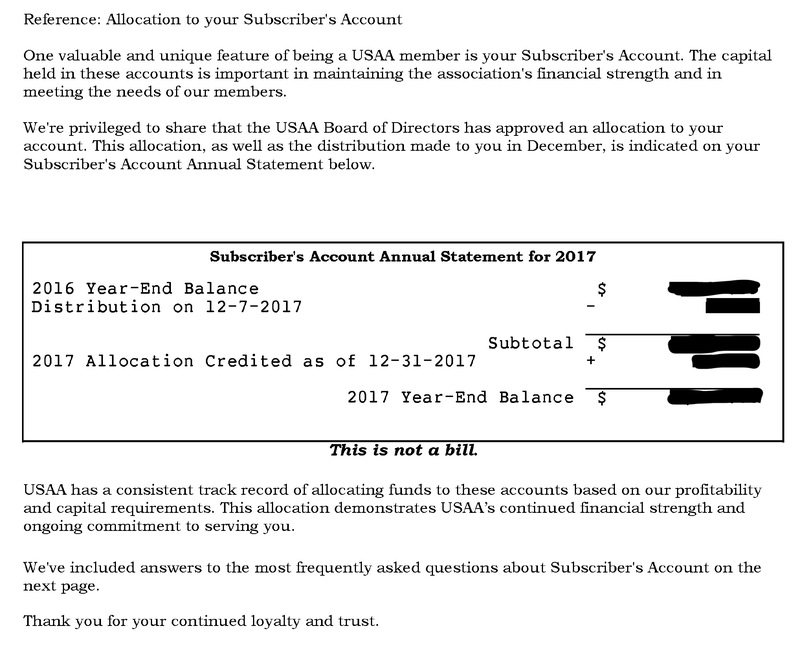 As you can see it shows your Year-End Balance, the distribution made for that year, the allocation that was credited to your account and the final year-end balance in your USAA Subscriber’s account. You can expect to receive this statement in mid February each year. How is The USAA Subscriber Savings Account Distribution Calculated? The actual calculation of the distribution is not disclosed by USAA, but it is generally understood to be a percent of your outstanding Subscriber’s Savings Account balance. For instance, if the board of directors authorizes a 4% distribution for the current year, and your SSA balance is $1,000, you will receive a distribution of $40 that year. Of course, the distribution percentage will vary each year, but historically it appears to range from 3-7%. Keep in mind that the “distribution” is different than an “allocation.” The allocation is a sum that is added to your Subscriber Savings Account each year, whereas the distribution is a sum that is paid out as cash to the USAA member. How Do I Get My USAA Subscriber’s Account Distribution? To change your distribution payment contact USAA customer service. What is the USAA Senior Bonus? The USAA senior bonus is a distribution to the Subscriber’s Savings Account for members with 40 years or more of membership. © 2019 Savermetrics. All rights reserved.